*All quilts sent on approval. Quilts are guaranteed for authenticity, dating, and condition. Over the years Rocky Mountain Quilts has been featured in more than 30 different Magazines. No restoration job is too big. No restoration job is too small. Some of the finest artwork you can invest in and enjoy forever was created by Early American Women who were only trying to keep their families warm while at the same time showing their mark of excellence as skilled needle workers. Those amazing artists, 50 to 200 years ago, produced beautiful quilts that you can now own and display on your walls or your beds today. These genuine antique works of art, with their innovative designs, vivid colors and intricate patterns, made by some of our own American ancestors, will continue to appreciate in value and bring beauty and joy to you and your family for years to come, at prices far below those of other forms of art. When clients come in the shop they see signs asking them please do not touch the textiles. All of the cotton quilts have been hand washed, and natural oils from our skin could stain the fabrics. After your hands are washed in our very clean washroom, then let's look at what you are searching for :-) I am fortunate that the antique quilt shop is in a barn attached to my home, giving me a 28 foot commute. My clients enjoy meeting our hypo-allergenic animals. We have a German Hunting Poodle who is a registered Therapy Dog, and two indoor-only hypoallergic Russian Siberian Forest Cats, who can often be seen sleeping on piles of quilts covered with protective sheets. People who love quilts also seem to love animals....and our animals love people. 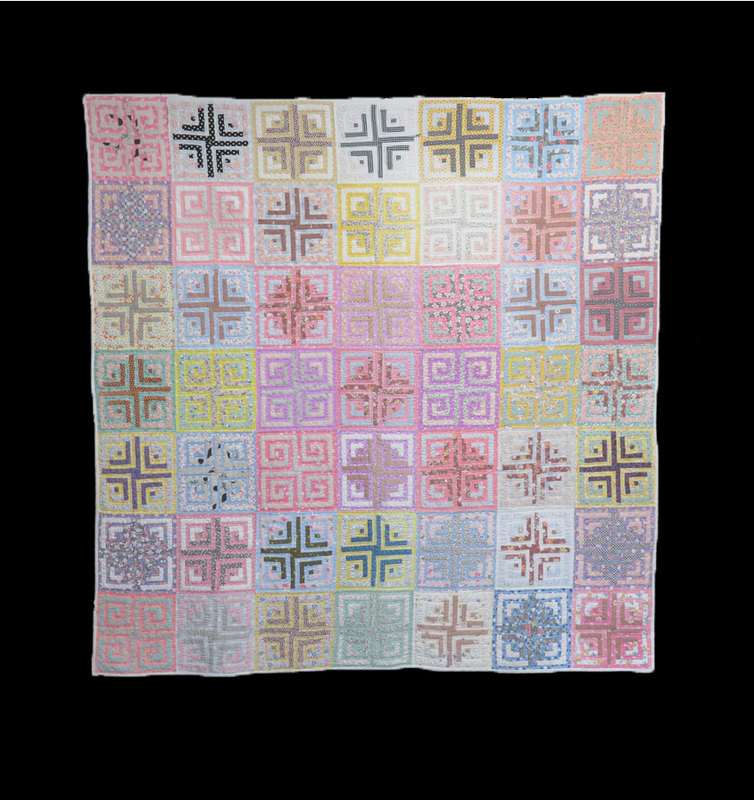 If you view pictures of our quilts on the web or from an email, please remember that different computers, tablets, phones, and especially printers, all display colors differently. Also, in your home the colors will differ depending on the type of lighting: incandescent, fluorescent, LED, or sunlight. That is one reason why we send quilts on approval, so you can see how they actually look in your own home. On this website, if you see shadows on a picture, they are from the photographer, they are not on the quilt. Please feel free to ask about our payment plans, including discounts for payment by check. Welcome to our online Antique Quilt Gallery where you can ask to see an Antique Quilt on Approval in the privacy of your home, or find information on our Quilt Washing and Quilt Restoration? 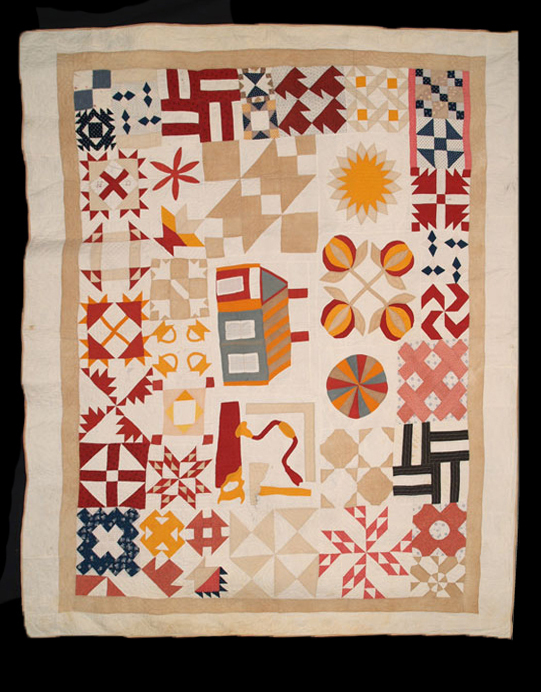 Over 95% of our antique and vintage quilts are in complete original condition, while many of the quilts are in unused condition. 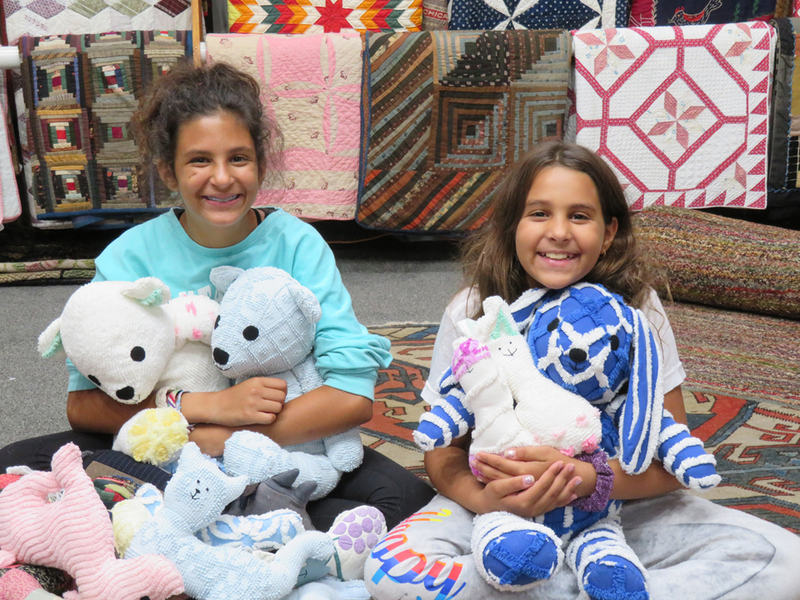 Our stuffed animals are created from over-loved antique quilts, ready to become someone's treasured friend. 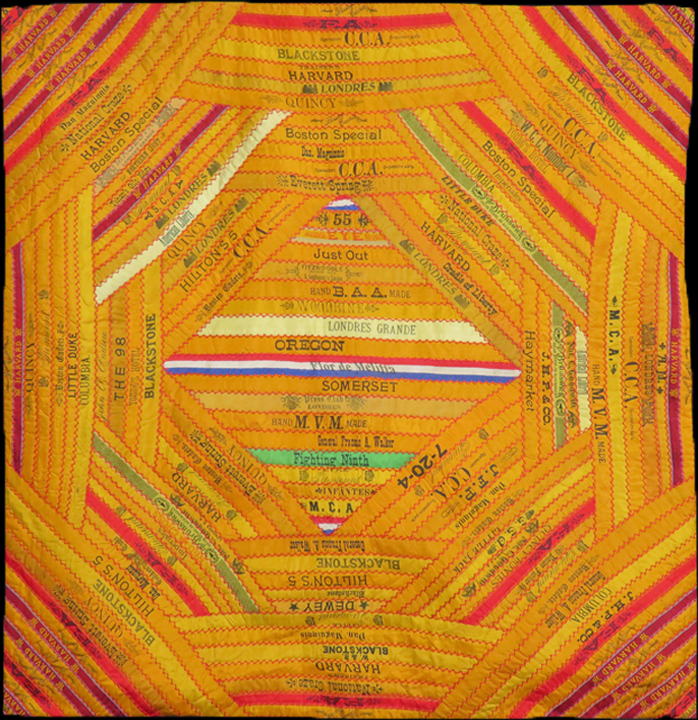 We preserve every restored quilt's integrity by using only same date or older original fabrics. See our Restoration information page or call us. 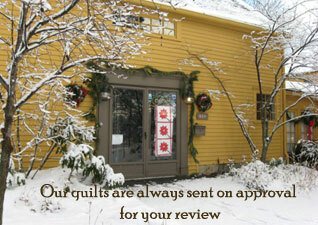 Shopping is made easy with our policy of sending quilts to you for review in the privacy of your home before purchase. Please call us with questions about any of our antique quilts, quilt tops, quilt blocks and vintage fabrics - we're happy to help you. We are located at the southern tip of Maine just 10 minutes from Portsmouth, NH in scenic York Village. Please call if you would like an appointment or an appraisal. Click here for detailed driving directions. 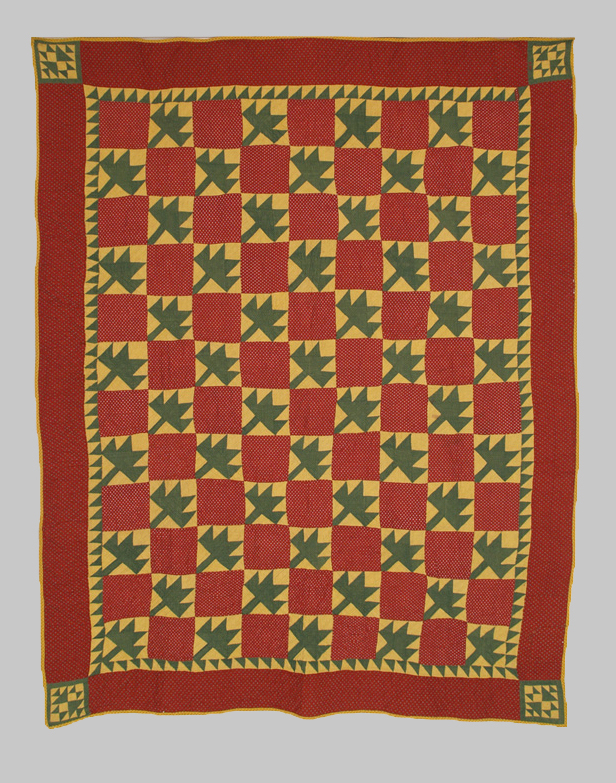 20 Categories of Antique Quilts to View - Click here to view my Antique Quilts for sale. Betsey Telford-Goodwin is a member of the prestigious Antiques Council of America, as well as the Maine Antiques Dealers Association (MADA), the New Hampshire Dealers Association (NHDA),the American Society of Interior Designers (ASID), and the Society for the Preservation of New England Antiques (SPNEA). 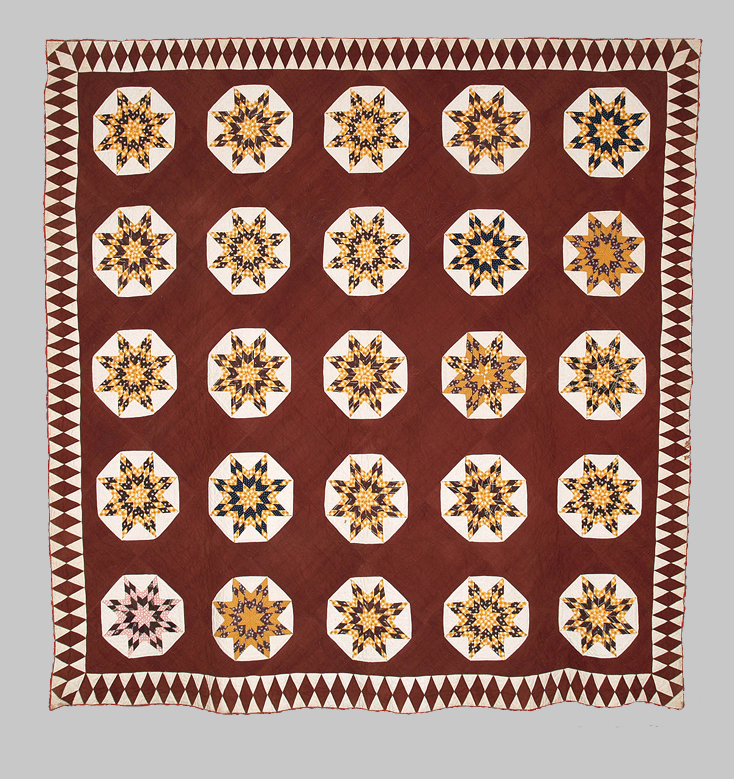 Rocky Mountain Quilts specializes in the full range of antique quilts dating from 1780 to 1950. However, our African American pieces date from 1880 to the 1960's. 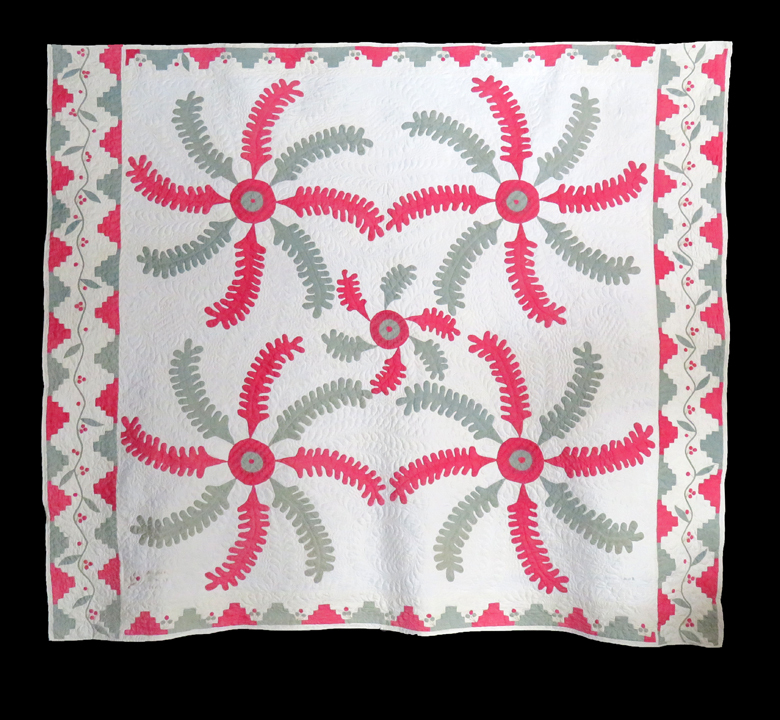 Our inventory reflects all categories of quilts; pieced, appliqued, folk art, Mennonite, Amish, African American, Victorian Crazy quilts, and Broderie Perse, among others, and are comprised only from natural fibers. 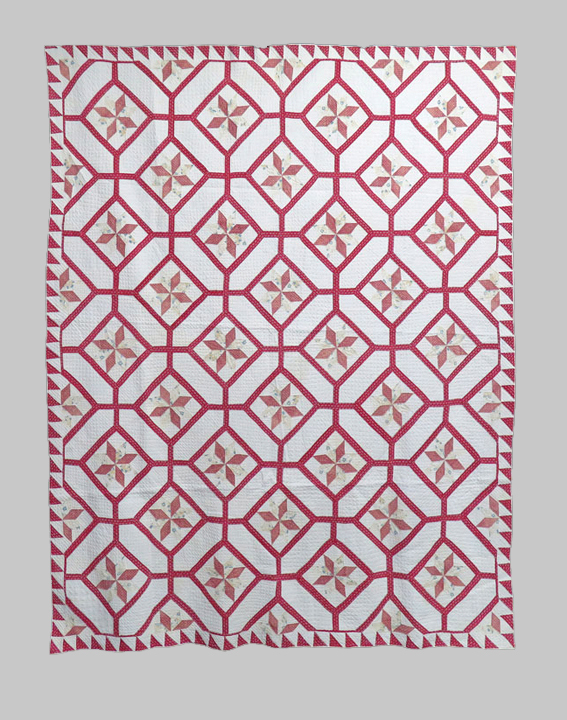 Our antique quilts are truly textile art for the wall or bed. 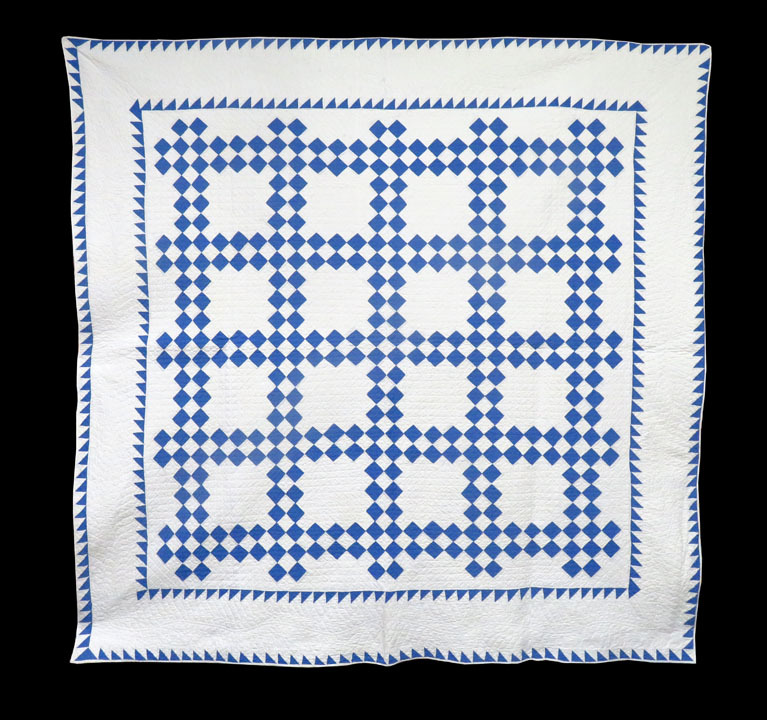 We also offer antique quilt tops, blocks, quilt fragments, feedsacks, and antique and vintage linens. Did you know that antique quilts are the most under priced art form in America today? If you do not see just the right quilt on our webpage to suit your particular needs, then please call or email us so we can look among the quilts in the shop and help you find the perfect quilt. When you are ready to purchase a quilt on our website, please do not email any credit card information, as email is not secure. Call 1-207-363-6800 and we will work out all of the purchase and shipping details at that time. 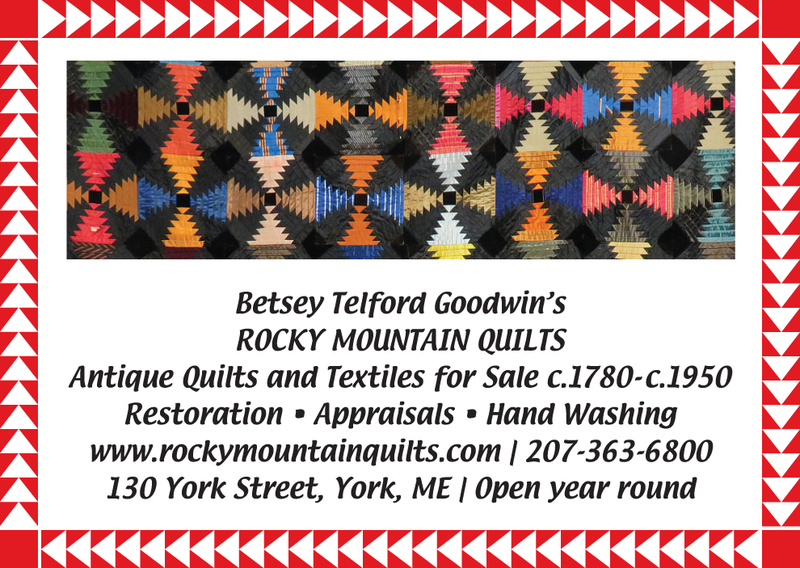 Rocky Mountain Quilts is located in a wonderful 270 year old post and beam barn attached to my home in York Village, Maine. It is filled to the brim with over 650 antique quilts waiting to continue their histories with new families. For those who enjoy the great outdoors, there are wide sandy beaches for relaxing, rivers and harbor for kayaking and the Nubble Light House standing guard on Cape Neddick for sightseeing. There are many historic buildings to visit in York Village, as well as privately owned shops to explore at your leisure. 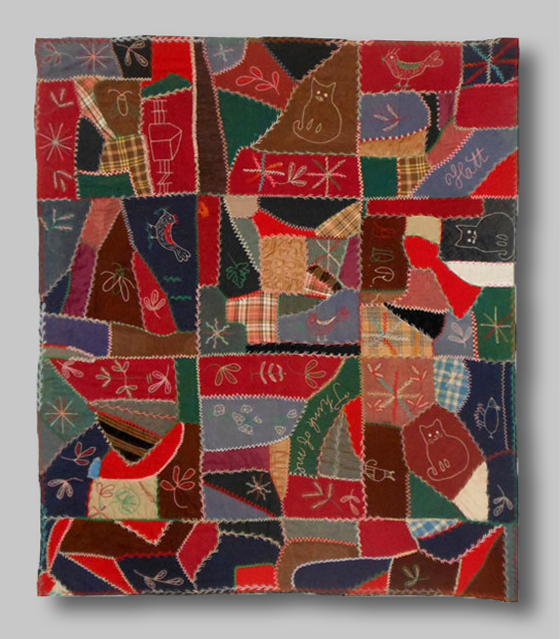 That special antique quilt, hooked rug, or other vintage textile can be art on your wall. Home of Rocky Mountain Quilts.